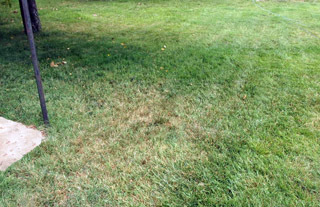 Dry spots can occur anywhere in your lawn at any time of the year. Most occur during summer stress periods with high heat and low rainfall. If not treated the grass can thin out or even dieback. While many grasses can safely go dormant in summer, improper watering can actually do more harm than good. The picture above is an annual dry patch over clay soil. Here a hole for a septic tank was dug and the clay soil was used to fill the hole back in. 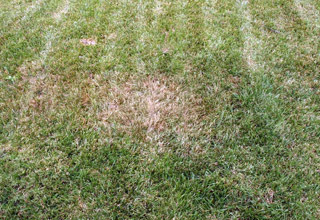 Dry spots usually do not have well defined borders, such as circles or streaks. Be certain that when looking at what you perceive to be a dry spot that it is actually a dry spot. If there are purple legions encircling tan spots or hour shaped tan lesions, then it is not a dry spot, but possibly a diseases. Diseases are active on the outside edge of disease spots and there you will usually find the symptoms that identify it. Excessively watering some disease spots can make it worse and even cause it to spread faster. This is easy to check. Take a metal rod and push it into the ground, push it forward and backward to make a hole big enough to see if the soil is dry. You can also purchase a moisture gauge that can tell you if it is dry and how dry. Most are very simple devices that have a metal spike that pushes into the ground and a gauge from dry to wet. The gauge is an instant read so it only takes a second to use. You can use it for potted plants to lawn soil. They can be purchased at any garden store. If the soil is dry then water the dry spot heavily and see if that improves the lawn. It should respond quickly, but may take a couple weeks for the grass to look like the rest of the grass if no die back occurred. To water correctly, the ground should be wet down four inches. Shallow watering will only encourage shallow rooting. This will have a negative affect in summer heat. Compacted soil is one of the most common reasons for dry patches to occur. Here are some questions to consider: Is the dry spot in a location that receives heavy foot traffic? Do you have clay based soil? Have you ever core aerated your lawn? Depending on these answers, you may have compacted soil. Clay soils tend to compact much easier than other types of soil as seen in the photo. In the photo, traffic coming off the patio has compacted the soil and the grass is not getting enough moisture. Compacted soil has compressed soil structure and squeezes the tiny air holes preventing water from seeping downward. Only the surface remains wet and the roots dry out. To fix this, core aerate your lawn and spread a compost topdressing on top, filling the holes with the topdressing. The holes will open the lawn allowing water and air to the root zone. The topdressing will help retain moisture, feed the microorganisms, and add organic matter to the soil to help prevent compaction. It will need to be repeated at least once a year for a few years to add enough organic matter to alter the soil composition. Doing this every year without fail is one of the best things you can do for your lawn. Thin Topsoil Over Shallow Rocks: I often get questions about this. After people have laid sod, a spot shows up that is always dry. Far too often the problem is a large rock or a group of several small rocks just below the surface that prevents the roots from reaching deeper into the soil. As soon as the soil heats up, the short roots are scorched and the turf suffers. To see if this is the problem, get a metal rod and push it into the ground to see if you hit rocks. The solution is to remove the grass in that location, being careful not to destroy the turf. Dig out the rocks and fill the hole with quallity topsoil. Replace the turf and water it frequently to help encourage root growth. This should solve the problem. Sand Patches: Parts of the country have very sandy soil. Some parts of a lawn may have patches with more sand than other parts. Sand does not have the ability to retain water. The more sand the soil contains, the less water retention it will have. If this is your situation, there is a solution. The solution is to add organic matter to the soil to help retain moisture. The best way, if the patches are small, is to carefully remove the turf and mix organic matter, such as compost or ground up leaves, etc to mix with the soil to a depth of 6 inches or more. Don't over do it, however. This will give the soil more ability to hold water and nutrients and add nutrients to the soil. If the patches are large, topdress your lawn with topsoil or compost. If you have sand/loam, then you can core aerate. The clay in the soil will help hold the cores together. The topdressing material will slowly work into the soil and help retain more moisture. Sodium Soil: Sodium (salt) is a common problem in many lawns. Some parts of the country are known for sodium soils. Sodium binds with soil particles that prevents moisture and nutrients from filtering down to the roots. In severe cases, you can get several inches of rain, but the grass will still look dry. This also occurs in areas where salt is used on roads during winter. Snow removal trucks can throw the salt/snow far into a person's yard and create many dry spots. The solution for sodium soils is to use Gypsum. Gypsum for lawns will release the salt from the soil and allow it to leach below the root zone. This recovers the soil structure so water and nutrients can again reach the roots. Conclusion: Dry spots are a easily fixable problem. It requires, in most cases, nothing more than a little investigation and water. Remember that deep roots are an important key to summer survival for lawns and for preventing dry spots. Mowing height is directly related to root depth. The higher you mow the lawn, the deeper the roots will grow. Therefore, summer mowing practices require you to mow your lawn at the highest recommended level for your grass type. Mowing height varies with grass species. Fertilize your lawn based on a sound fertility schedule. You can find that information on this website. Without nutrients, the grass will not be able to handle stress problems efficiently. While all the nutrients are important, Potassium (the third number on a bag of fertilizer) is very important in helping relieve stress. When applying potassium, the number should be 10 or higher on severely stressed grass. A soil test will also be helpful in determining if potassium is deficient. Biostimulants are now being used more than ever before. Many companies are putting biostimulants into their products to promote root growth and help in stress. Agrigro Biostimulants, that we sell, are proven to promote deeper root growth that can save your grass and plants during stressful periods. Kentucky bluegrass is one of the most popular of all cool season grasses. It is used on lawns, fairways and athletic fields in the cooler areas of the U.S. Find out what makes this grass so special. Warm season grasses include Bermudagrass, Zoysiagrass, Centipedegrass, St. Augustinegrass and others. Here is everything you need to know about these grasses, tips and techniques, and maintenance practices. A sound fertility program is very important. Learn how to develop an easy program for the type of grass you have.